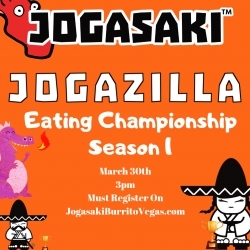 Las Vegas, NV, March 18, 2019 --(PR.com)-- Jogasaki Sushi Burrito Las Vegas, Home of the Original Sushi Burrito™, is excited to be hosting the JOGAZILLA Sushi Burrito (a 2-pound OG Sushi Burrito) Eating Championship Season 1 on March 30, 3 pm at the restaurant: 7365 S. Buffalo Dr. Suite 115, Las Vegas, Nevada 89113. This Sushi Burrito Lover’s Contest will determine bragging rights of being the overall JOGAZILLA Champion for Season 1 and $200 in cash and prizes. Calling all Sushi Burrito lovers and those that love food challenges to Jogasaki Sushi Burrito, Home of the Original Sushi Burrito™, for the first ever Jogazilla Sushi Burrito Championship in Las Vegas. An Entry fee of $20 will get you a JOGAZILLA Burrito, one soft drink, one Jogasaki Tee shirt, a Jogasaki bumper sticker and most importantly, enter you into the Jogazilla Championship. The contestant that finishes their JOGAZILLA first, will not only hold the title for a season but will win $200 in cash and prizes. The winner will also be awarded the JOGAZILLA glorious 6-pack Sushi Burrito Belt with all the glitz and glamour that comes with the title. To enter the contest, call Jogasaki Sushi Burrito at (702) 998-8989 and let them know you are entering the contest/pay your entry fee -OR- stop by the restaurant and enter in person. The last day to enter the contest is March 29, 2019. But What exactly is a JOGAZILLA Sushi Burrito? This proprietary Sushi Burrito created and designed by well-known Chef Yo is 2 pounds of tempting deliciousness with the following ingredients: Spicy Tuna, Yellow Tail, Salmon, Surimi Crab Meat, Shrimp Tempura, Avocado, Cucumber, Asparagus, Sweet Sushi Sauce, Joga and Yum Sauce. On their lunch and dinner menu, for $1.00 more, you can opt for the Fire-Breathing JOGAZILLA which adds Chef Yo’s Tres Chilies Hot Sauce, Jalapeno and Siracha. This spicy option is highly recommended for those that love alarming spicy food. From its early beginnings as a food truck in L.A. (2011) to the first brick and mortar restaurant in 2018 in Las Vegas, Jogasaki Sushi Burrito has become a favorite among locals and a delight for all sushi lovers. Jogasaki has fused together the perfect blend of fresh ingredients, creating a one of a kind taste sensation experience. Signature Sushi Burritos, Specialty Sushi Burritos, and Catering are available. Jogasaki Sushi Burrito Las Vegas is located on the corner of Buffalo Drive and Warm Springs Road at 7365 S. Buffalo Dr. Suite 115, Las Vegas, Nevada 89113. The restaurant can be called at (702) 998-8989 for orders, for catering or for any questions. For more about Jogasaki Sushi Burrito Las Vegas visit the website at http://www.jogasakiburritovegas.com.